Here’s a look that I like because of the pile of pearls. Take them away, and the outfit isn’t quite as appealing — at least, not to my dressy and pearl-loving self. I love the juxtaposition of the casual “thrown together” layers, with the bling. Go Team Glam at any time of the day. If pearls aren’t your thing, add bling that is more to your taste. 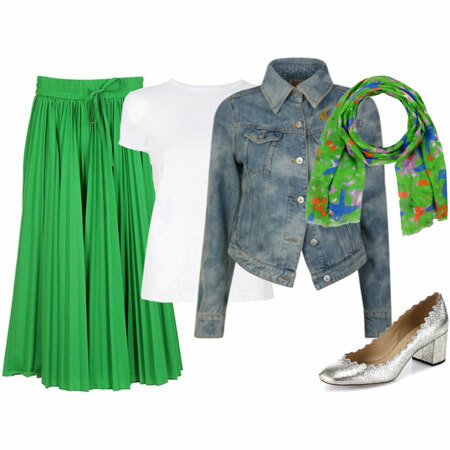 Here are the components of the outfit formula. Use any colour palette. I stuck to neutrals, but feel free to throw in some colour. 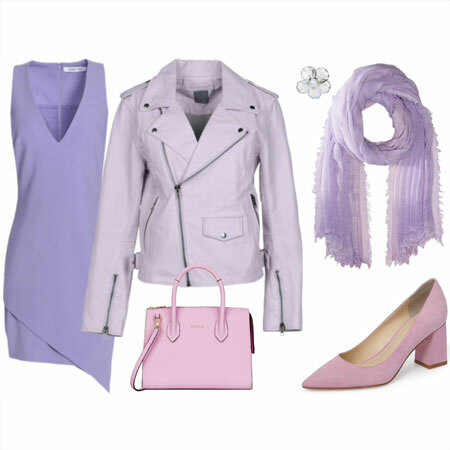 Note that you can mix many neutrals in one outfit to create a harmonious look. Tight Bottoms: Choose a pair of form-fitting jeggings, leggings, Ponte pants or skinnies in a dark neutral. Make sure you can tuck the bottoms into boots. Tee: Choose a striped T-shirt in any colour combination. Shirt: Choose a denim or plaid shirt and layer it over the striped tee keeping the front unbuttoned like a jacket. Tall Boots: Choose a pair of casual knee-high or mid-calf boots, and wear them over the jeans. Again, feel free to remix an assortment of neutrals in one outfit. No need to make them match. 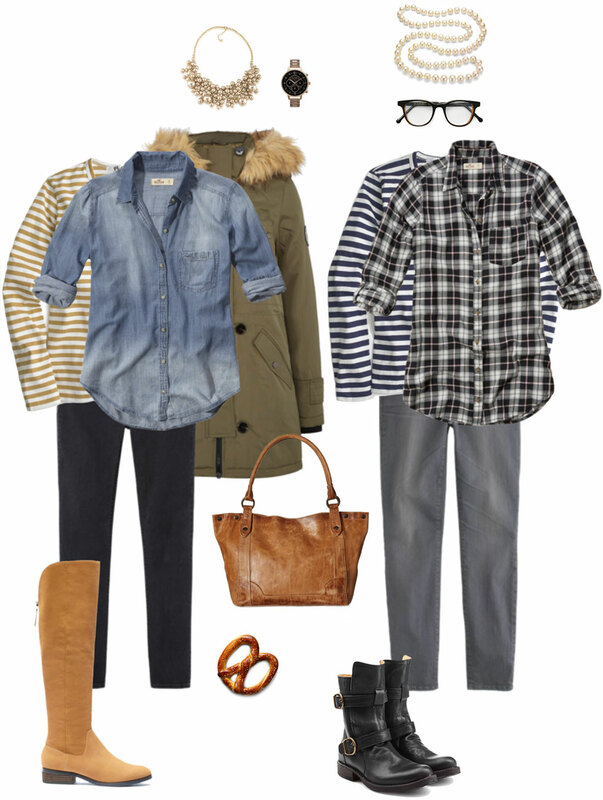 Topper: Add a topper like a casual parka, trench coat, or pea coat. Bling: Add a pile of chunky pearls, or another form of bling around your neck. Feel free to add blingy arm candy too. Accessories: Finish off the look with a casual bag like a hobo. Add jewellery, eyewear, headgear and watch as desired. This is right up my alley and totally appropriate for my casual work place. I also love that the ensemble consist of fairly basic pieces most women are likely to have in their closet in one form or another, and shows us a new way to put them together. I can interpret this in a couple of different ways, and will start with one version today. I am very happy to be able to wear the Friday ensemble outfit as soon as it is posted again. This is so me. I love everything about it. I am looking at that J. Crew striped T in olive. Love the heart. Very nice casual with glam I always like some glam in outfits. Big fan of juxtaposition, so I may give some version of this a go. Thanks, Angie. Much too casual for me. I’ll just enjoy the look on others. Another fan of juxtaposition! Will definitely play with this idea as soon as the weather cools off again! Thank you! Casual glam, (almost) an oxymoron? Not with bling as balancing act. Love! I like this look, the casual-ness really appeals to me. I don’t know if I would do the bling as a necklace but definitely as a bracelet. A great casual outfit that will fit in well with my lifestyle… and I have all the pieces. Now all I need to do is wait for the cooler weather to set in. Thanks Angie! I need to try this, just need to find the right outing for it. i have all the components in some form or other including a long strand of pearls that I’ve had for decades and hardly worn. It would be a new idea for me, and I’m looking forward to it! This ensemble couldn’t be more me if it tried (with a few modifications, of course). Keeping this one in mind as I plan my wardrobe refresh for the season. I could do this….once it actually cools down! Insert my head on top of either of those, and that’s how you’ll see me on any given weekend (and the odd weekday !). I’m really into tall boots again after several years of only wearing OTK versions or booties. It’s a youthful, fun look . I also have been wearing some different new silver/blue/brown leather jewellery lately that would work really well with jeans too . Very statement-y. I think I’ll whip together something based on this formula today- thank you for the inspiration! 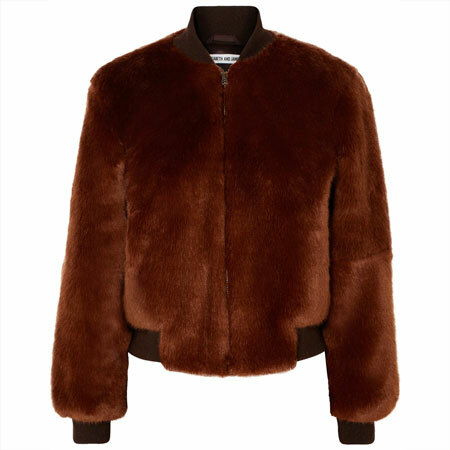 I am filing this one away for later in the fall/ winter. Because, you know, today is the last day of baring toes where I live and I am going to enjoy that to the fullest!! I have this look pinned.. I was attracted to the opposites of the casual with the pearls, that ying/yang juxtaposition I find appealing. I garner even more understanding when you break down each detail. I’m not a pearl wearer but this is a good reminder that I should start wearing my necklaces again, and that they look good in casual ensembles too. I barely wore them at all last year…. I’m not a fan of the open shirt look so I’ll most likely do this with the shirt buttoned up at least partially. 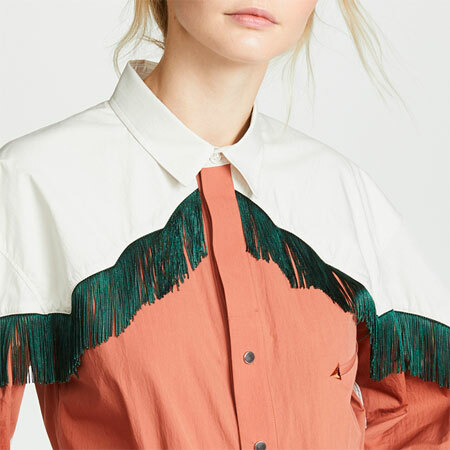 I have really been loving the idea of layering things over long sleeved striped shirts lately, and have just acquired a new one, so I’ve got the pieces for this in my closet. When it gets cool enough I can do this right from my closet. I like it a lot and it is the way I like to dress in cool weather. I don’t always wear such noticeable bling but I do love to wear necklaces and bracelets so I think I can do a decent rendition. Nice! If I did this kind of blinged up casual it would be the same but different, hehe. In other words I wouldn’t wear a button down or stripes as they don’t exist in my wardrobe. Very cute! I actually have the elements and could do this. Let’s see..
Love this and can’t wait for the weather to cool off so I can put it into action! My look during the fall/winter months for me. So many textures and visual intrest. I like Angie’s versions, with the striped tee, better than the inspo photo where she’s wearing two button front shirts — that seems a bit clunky and fussy to me. I’m not a pearl girl, but I’d like to find my own signature bling; my jewelry tends to be much more understated. This is right up my alley! I have all the components — even a string of faux pearls that I inherited from my grandmother, that I like but haven’t worn in ages! Maybe I’ll pull them out on next week and wear it with plaid flannel and layers. (No point today, because it’s a work from home day and I won’t be leaving the house at any point, except to drop off one of my kids at school — and I no longer even have to get out of the car!). I really like the maximal stripe-with-plaid look, too. Wooohoooo. Lots of love for this look. An quite understandably. It’s trendy, practical, comfy and easy to pull together. Can’t wait to see what you come up with, ladies. (Happy Thanksgiving to all the Canadians). Tanya, I knew you could do this one a few times over. Excited to see your renditions. Mirjana, LOVE glam in outfits too. High five. Ornella, isn’t it a great oxymoron, don’t you think? RobinF, bling arm candy is another good way to go. Lisap, your new blingy silver and leather jewellery sounds fabulous. Love that you’re loving your tall boots again. Try the L/S tee under a plaid shirt idea too! Suz, enjoy your last warm day of sandals. Diana, I enjoy wearing a long sleeved thermal tee under my plaid shirts too. And I MUST add the pearls to make the outfit feel glam and pretty. Tex and Aziraphale, this is JUST up your alley. Diane, we are going to get you into a low contrast and subtle striped shirt one day! I can put together endless combinations of this formula! I’ve just to remember to add the bling. I like the bling part to dress up a casual outfit and will have to try this when the weather cools down. The part I may not have is the tight pants but I can improvise. The stripes with plaid, tall boots, and pearls look great together in these photos. I have these items but have never put them together in this way. I’ll give it a try when it gets cooler. I really like your rendition with plaid shirt combined with striped top. I am going to try out this look this weekend from items already in my closet! LOVE this! Thank you for spelling out all the elements. Wondering how to make it work with black knee-high boots, and where to find the right striped shirt. I really like the horizontal stripes on the (presumably woven?) dress shirt as alternative to the mariner tee. My one striped top is in the dirty clothes as I wore it last night. I knew something was missing and now I know it was bling. We’re going into the 80’s today, so this is an outfit for another day. My striped top is somewhat of an enigma, 3/4 sleeves with white background and pink, orange, lighter green, etc. stripes. Nice! My eyes went straight to the pretzel, though. Love it, I will try it this fall! I love big faux bling with casual outfits, but I can’t wear an open button-down over ANY type of shirt. Must be some outfit I was forced into as a child that has scarred me for life!!! I often use my shoes as the bling with a casual outfit. I love to pop on a metallic sandal or flat, or something in a patent leather, or a rich suede chunky-heeled pump. It’s dinner-and-a-movie night for me tonight, and I think some version of this will be just about right. Thanks for the inspiration! Oh this is a great easy one for my sahm status. It would be a good exercise for me in casual layers. My layering experience is primarily business/dressy. Necklaces are dicey bc of my 9m old. A few necklaces have been broken as he is grabby and impressively strong. I do have a chunky pearl one in mind…..wonder if it can stand it’s own against Mr. Grab Hands. I’ll try this one next week! So today at 6am, I’m standing in my closet, staring at a plaid shirt, toffee-colored jeans and boots, and my navy Vince side-zip sweater. It felt a bit lumberjack-esque and I decided not to wear it because, let’s face it: It was lacking a certain je ne sais quoi. Now I know: The je ne sais quoi the outfit needed was a big fat pile of pearls! Another wardrobe crisis averted, thanks to YLF. I love the look. I’ve tried on my oversized pearl necklaces from the 80s recently, and I’ve always ended up taking them off. I think I don’t have the right ones. I’m not sure the pile of pearls really suits me, though. If I were to wear this look, I’d have to come up with something other than the striped tee to put under my denim shirt. Maybe a plaid tee. Super wearable for those of us with casual dress codes. I can’t wait to try it. I love that several forum members have already styled it today! The feature where you can link a blog post to a forum thread is one of my favorites (thanks Greg). It was supposed to top out at 80. It’s 89 so far. Shorts or capris or lightweight dress and sandals weather, even if it’s fall. Will need this info in a month. Or later this week. One never knows. Love this look. It is casual in a grown up way! Can’t wait fir the weather to cool down. CUTE! I’m all for casual glam and love this look for weekend I would swap the top shirt layer to a jacket as I’m not a fan of the “shirt as a jacket” look for myself; I’d even prefer a cardigan. Might try with the top shirt buttoned halfway, though. Was surprised that I was able to pull a few versions from my closet since I’m low on stripes; most of what I have are ultra casual tees which I’m ambivalent towards. Did a dressy version for work today though! Will post tomorrow since I’m going to have to modify for a casual evening event and it’ll be fun to compare the two versions. FUN seeing all the renditions on the forum. One of my most favorite formulas ever! Casual-with-pearls has my name written all over it, so count me in, too! I’d wear it with my black or grey knee-high boots and be as happy as I could be. I LOVE this outfit and will definitely do a rendition once cooler weather hits here. As a MOTG I need to dress pretty casually often, but my natural style is dressier, so i love this pulled-together look with the addition of pearls! 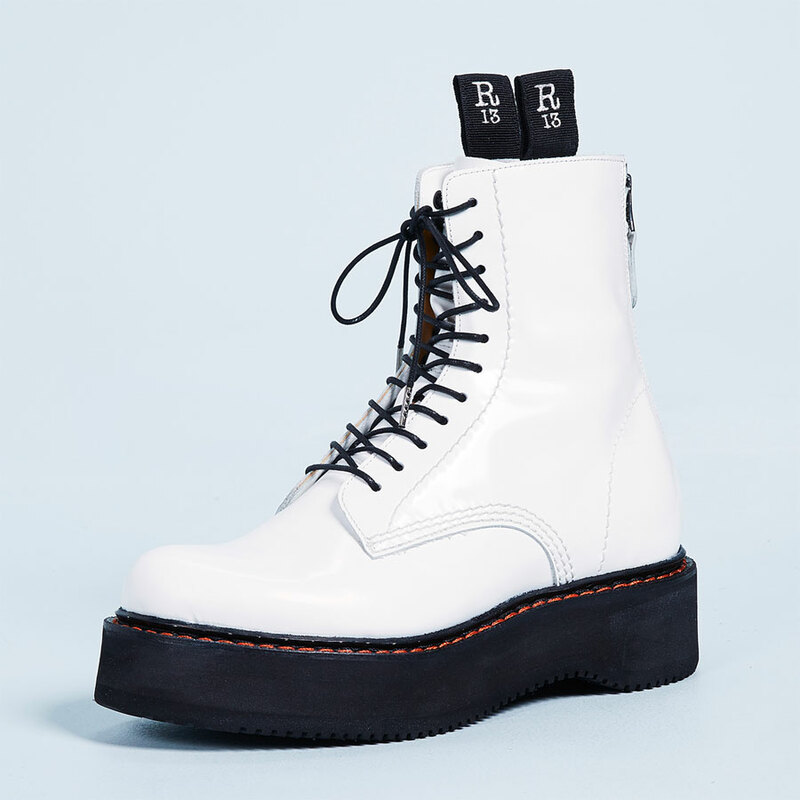 Do you plan to do a post on casual boots and booties? (Please, please please?) I could really use some help adding a pair or two this winter. I have perused booties you’ve added to finds so far but find many of them dressy. And I actually though knee high boots were sort of out of fashion at the moment. I love his formula! I can’t wait to wear it when our weather gets cool. Love this formula! Haven’t been wearing pearls during hot super casual summer but I want to dig them out again. I have been wearing my chambray button up over a tee as it has been a warm fall and it has become a good substitute for my denim jacket. I love this and have everything in my closet. I will wear this ensemble some time this week. Pearls are such a special form of bling. Usually when I think “bling” I think SHINY, but pearls seem ultra sophisticated and glamorous, instead of flashy. I love this combination! Such a fun look! I have a beautiful strand of vintage gray pearls that I haven’t worn in a while. I’m inspired to break them out and try them in a while new way now.